It's based on a True Tree! How can you miss watching "Devil's Tree" (2018) with us? Listen above, or click the links below to subscribe in various ways. 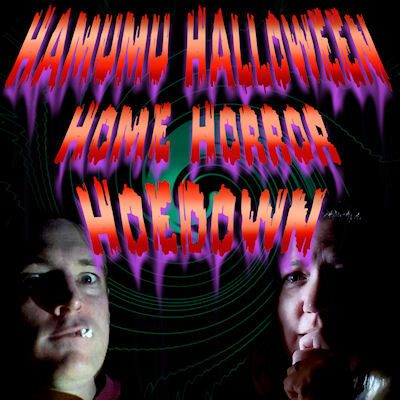 Welcome back to the Home Horror Hoedown! This year, Solee and I will be dissecting each movie in a podcast. Listen to today's entry above as we tell you all about the 2018 movie Unsane. You can even subscribe in your favorite mobile app with the links below. You don't want to miss a moment of the thrills and chills, right?! Like every year, I am going to spend the month of October watching and reviewing 31 horror movies. And like most years, I'm changing up the format of my reviews again this year! So, we've done basic text reviews, reviews with a drawing inspired by the film, reviews with a new movie idea inspired by the film, video reviews, text discussions with my wife (and once or twice, special guests), and now... it's a podcast! My wife and I, in your ears, ranting and raving about all the stupid little things we have a problem with, in 31 different horror movies all month long (or whenever you feel like listening to it). As usual, we will be GOING NUTS WITH THE SPOILERS so we strongly encourage you to watch the movies before listening to our glorious takedown. In order to facilitate that, I'm actually going to give you a decent head's up for once. Here is a handy list of the first 10 movies we'll be covering, and what streaming service we used to watch them. I'll make sure to update you on the next 10 when I can! Don't miss out! This is my favorite part of the year! On the first of October, we'll be sure to provide handy links to subscribe to the podcast in iTunes and Google Whatever. So tune back in to this page for spooky goodness. Hey gang, a month and a week later, I am back with more bloggy words! I have no particular excuses for my absence. I've just been plugging along on the same-old same-old, and didn't feel like working on my blog! That's something I want to try to improve upon, but then, so are a lot of things - my health, my work, my board games, my ukulele playing, and so on. Doesn't mean it'll happen. But I intend to try! Robot Wants It All is coming along really well. 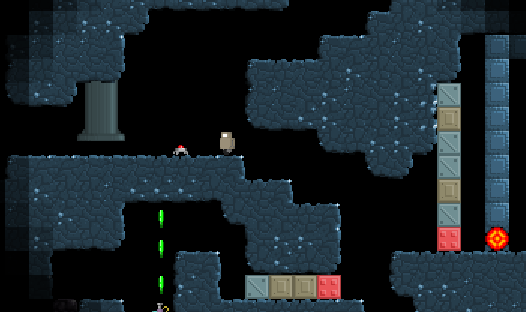 At this point, I'd say what remains is most of Robot Wants Justice, which is still in pretty early stages, most of Robot Wants Ice Cream which has just barely been ported (you can currently roam around in the level, but can't use any of your abilities, so it's quite limited), and a couple of other minor elements - some achievements, some bonus features, some of the extra maps (only a couple of those though!). It feels like we're really getting there now. Oh, and of course I have been streaming the development of that game (will do again later today) at Twitch.tv/hamumugames, usually twice a week, so come on by and watch me work. Watching someone program (or do pixel art, or level design) is not interesting to everybody, but you never know until you try! I like to chat with the viewers and get ideas from them as well. Plus you get to see the game as it develops. If you subscribe to my Twitch channel, it will notify you when I start streaming (which I try to do on Tuesdays and Thursdays). I have lots of other things to tell you about, since I haven't blogged in forever, but let's just save those for another day, so I have reason to come back. See you soon, internet! Yay, we got a trailer made for our new game! Watch it and enjoy it! It's super awesome! I wanted just a straightforward gameplay trailer, but the creator (Katana Video Production) recommended this ridiculous live-action stuff, and convinced me. I think to the benefit of the entire world. 13 comments Back to top! It is revealed! 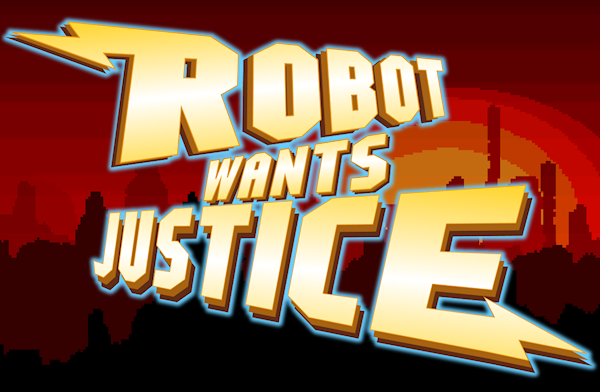 The 6th Robot game is entitled Robot Wants Justice, and it's all about Robot deciding he's done enough for himself (which has rarely worked out well anyway), and wants to do something for others. Exactly what that is and how it works, you'll find out as it goes along. You can find out quicker by watching me develop it on my Twitch Stream on Tuesdays and Thursdays (today!). I missed the one on Tuesday, but I am back today! In other news we have been beta testing the parts that are done, and moving along rapidly. Our bug list has gotten massive, and then gotten chopped down again, back and forth. We've fixed over 100 bugs at this point, and things feel so much more solid than they did. The funny thing is, the game felt done and polished to me before I brought on the testers, and then they just tore it to shreds. Including some really basic stuff. The things that when I play other games I go "Come on, how could they have even played this level and not come across that bug?!" I guess it happens! Here is something new and exciting in Robot-land! 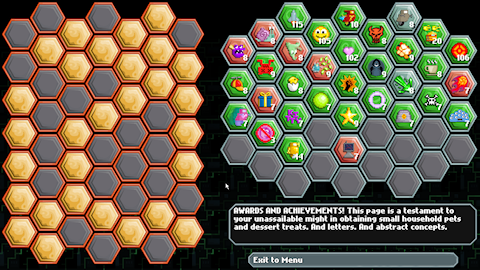 So, when you win a level, the game dishes out an assortment of what it calls "awards" to you. Not all awards are good - you can see there's one grey one on here (the one with the green arrow), and three red ones. Green awards are good. You gain Moneys for each one of those you get. Red awards are bad, and they cost you money (the red Moneys you see flying in this shot are money being sucked away from your counter). Grey awards, they're fine, no money gained or lost. So some of this stuff is pretty obvious, like "finish the level very fast" is a really good award, while "finish it really slow" is a bad award. But there are also sneaky weird ones for doing special types of runs that are abnormal. I have plenty more I intend to add as well. In the end, there will also be an awards screen where you can see how many times you've earned each award, and of course the real point of that screen is to wonder at the ones you haven't gotten... how do you earn them!? Mystery, my friend, mystery. If you're wondering how an award differs from an achievement, that's pretty simple. 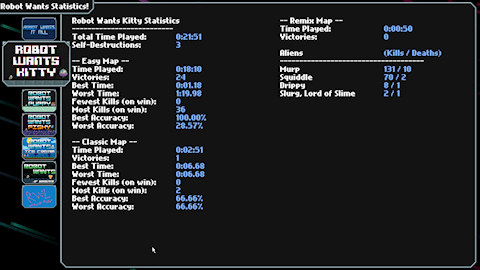 We will have both in this game, and an achievement is something you earn once (like "You beat Robot Wants Kitty! "), while awards can be earned every time you play a level. Of course there might be an achievement for getting a certain award for the first time, but such is life. 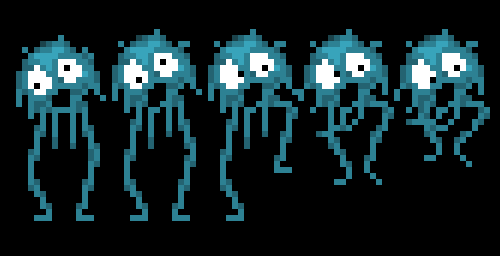 There will be achievements for some weird things (you've seen them in the original Flash games - like the one for getting through the undersea tunnel in Robot Wants Fishy without getting hit). You know, the traditional kind of tricky achievements.